As nighttime arrives, previously obscured light sources begin to dazzle the eye. City lights sprawl across Earth’s surface. A constant glow hovers in the upper atmosphere. Beyond Earth, starlight fills in the darkness of the cosmos. 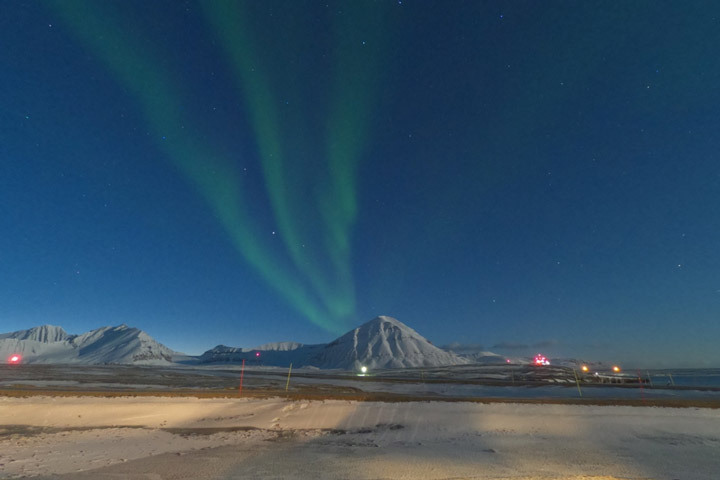 From the vantage point of space, we can get a unique view of each of these nighttime spectacles. On October 7, 2018, an astronaut aboard the International Space Station (ISS) shot this photograph while orbiting at an altitude of more than 400 kilometers (250 miles) over Australia. In this view, stars appear more numerous along the image center, where the plane of our disk-shaped Milky Way galaxy extends into space. The oranges (above) and greens (in the video below) enveloping Earth are known as airglow—diffuse bands of light that stretch 50 to 400 miles into our atmosphere. The phenomenon typically occurs when molecules (mostly nitrogen and oxygen) are energized by ultraviolet (UV) radiation from sunlight. To release that energy, atoms in the lower atmosphere bump into each other and lose energy in the collision. But the upper atmosphere is thinner, so atoms are less likely to collide. Instead they release their energy by emitting photons. The result is colorful airglow. 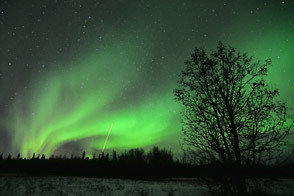 Some airglow, however, can be caused by collisions. This type of airglow is known as chemiluminescence or “nightglow.” The brightest green light in the first few seconds of the time-lapse video is due to oxygen atoms that have recombined into oxygen molecules. Yellow colors are caused by emissions from a sodium layer. Other reactions can produce red, blue, UV, and infrared light. 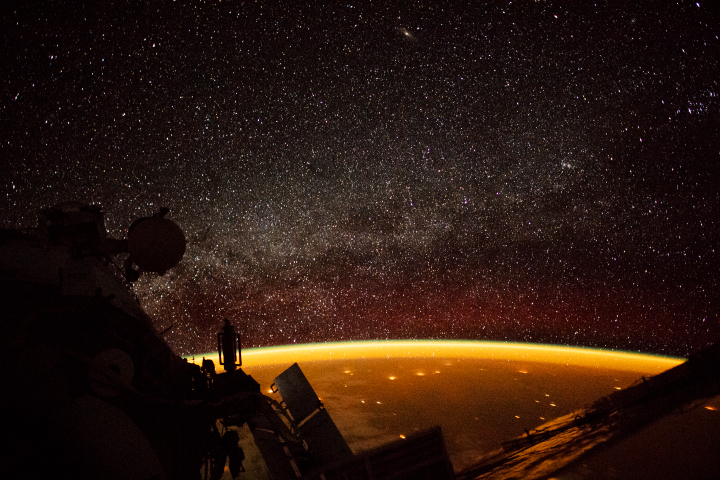 Red airglow shows up about halfway through the video, which was composed from photographs taken by an astronaut over a span of 26 minutes on October 7, 2018. The ISS passed over Bangladesh, Australia, and then New Zealand. Notice the flashes of lightning that also illuminate the atmosphere. More than just a pretty light show, airglow reveals some of the workings of the upper reaches of our atmosphere. 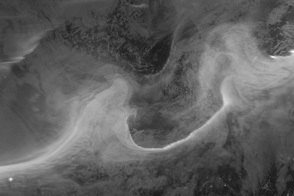 It can help scientists learn about the movement of particles near the interface of Earth and space, including the connections between space weather and Earth weather. Astronaut photograph ISS057-E-35382 was acquired on October 7, 2018, with a Nikon D5 digital camera using a 24 millimeter lens and is provided by the ISS Crew Earth Observations Facility and the Earth Science and Remote Sensing Unit, Johnson Space Center. The image was taken by a member of the Expedition 57 crew. The image has been cropped and enhanced to improve contrast, and lens artifacts have been removed. The International Space Station Program supports the laboratory as part of the ISS National Lab to help astronauts take pictures of Earth that will be of the greatest value to scientists and the public, and to make those images freely available on the Internet. Additional images taken by astronauts and cosmonauts can be viewed at the NASA/JSC Gateway to Astronaut Photography of Earth. 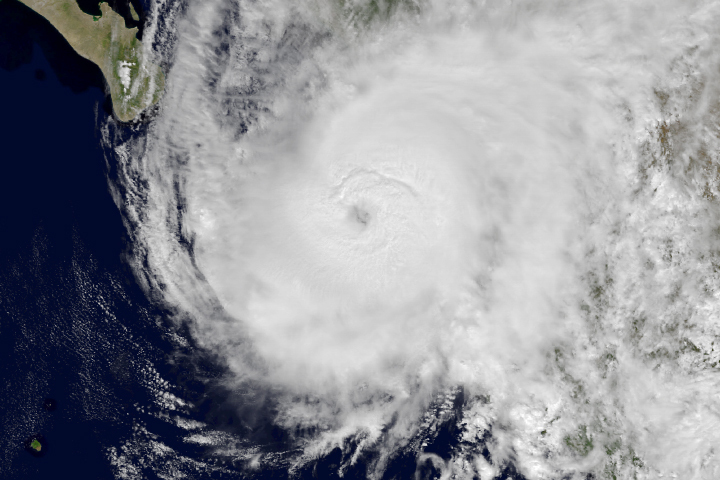 Time-lapse ISS video by Andrea Meado, Jacobs Technology, JETS Contract at NASA-JSC. 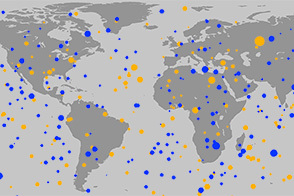 Airglow video by Joy Ng/NASA GSFC. Story by Kathryn Hansen. Atmospheric Optics (2018) High Atmosphere. Accessed October 19, 2018. 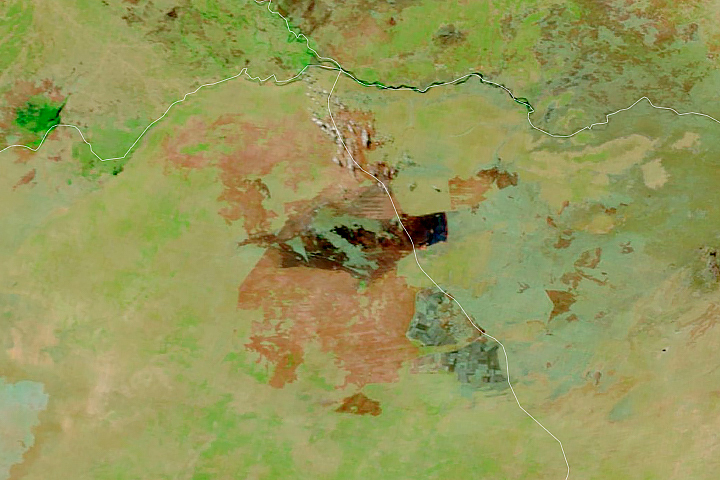 Gateway to Astronaut Photography of Earth (2018) Crew Earth Observations Video Page. Accessed October 19, 2018. 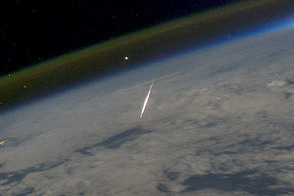 NASA Earth Observatory (2011, August 17) Looking Down on a Shooting Star. NASA Scientific Visualization Studio (2018, October 22) Airglow.